He is one of my favourite people in the world, and I pray for him every day – Dr Ahmad Badr al-Din Hassoun, the Grand Mufti of Syria. I don’t know any other religious leader in the world whose first words to me when he sees me are “I love you!” Even I don’t greet people that way! I suppose I’m too self-conscious, or perhaps I just don’t have that much love in my heart? 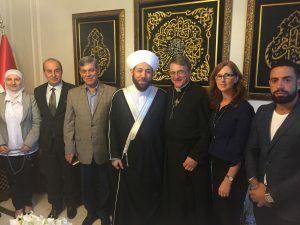 When I told Dr Hassoun that I was working on a book entitled “Christians and Muslims can be friends” he was very happy to be involved, which was just as well, as no publication on love between Christians and Muslims would be complete without Syria’s Grand Mufti. Dr Hassoun is a very loving man, and an embodiment of the hope we have for a new Syria emerging on the other side of this conflict. Will you join me in praying for him?